The engine hours are estimated by the seller based on use. Engine is tagged as "Engine Family 2GM-20-93" and has "Certification M140139202" also tagged on motor. All sails are in marked bags and stored dry. Roller Furling is Schaefer. Blocks, hardware are Schaefer, Spinlock and Harken. Cordage is Spectra by New England Rope. There is a Genoa, Mizzen and Mizzen stays'l, main and spinnaker. All sails manufactured by Quantum. Genoa, main and mizzen are Bainbridge "Classic Cream" Dacron while the spinnaker and mizzen stays'l are Bainbridge Stabilkote 4 nylon in .75 oz. The 3/4 oz Spinnaker has a carbon fiber pole. Lines are led aft to rope clutches, winches are all self-tailing Lewmar. Total sail area is 582 sq ft. All spars are Alaskan Sitka Spruce built in-house at Legendary Yachts, scarfed for length and hollow-box constructed. Length overall is 36' with bow sprit. This vessel is an L. Francis Herreshoff 1949 design replica. Laminated Brazilian Mahogany frames and planked with bright Douglas Fir. Headliner inside is Mahogany frames with marine plywood over. Hull has three epoxy coats on the inside, 2 layers of Dynel Boat Cloth and epoxy layers on the outside over which is painted Awlgrip topsides and hull. Bottom is awaiting re-launch to paint. Interior and cockpit configuration is of a daysailer. It has a long keel with molded lead ballast (5950LBS) which is through-bolted into the bilge where the keel bolts can be seen. Once the frames and jigs were set up to build this boat Legendary Yachts built three hulls -- this boat, another which is owned and sailed by the builder's family, and a third hull which is also available. This third boat is incomplete -- a hull with no deck or topsides finished -- for sale to be finished to the buyer's requirements. This vessel was designed as a daysailer with a sleeping interior. There is a small built in counter / table on the aft port side where a modest galley could be constructed if desired. There are two settee seating areas alternating as single berths, one on each side plus a generous "V" berth in the bow. There are 4 gold plated bronze opening port lights allowing for ventilation. A bulkhead separates the interior living space from the engine room. As designed the vessel has limited head room with seating only. Under the hinged aft end of the "V" berth (just aft of the main mast) there is a self contained waste unit. (Porti potti) The family-use version of this boat is used for camping excursions when over-nighting but is primarily used as a very fast and fun daysailer. Modifications to the interior accommodations are still possible at a very reasonable shop rate by the craftsmen at Legendary Yachts. 22 LB Bruce anchor is stowed with 20 feet of galvanized chain and 20 fathoms of 3/4 inch nylon rode. VHF ICom M-125, Raytheon Autohelm, Raytheon ST 60 Tri-Data, Raytheon ST 60 Wind, Compass is lighted. All USCG Safety requirements such as flares, life jackets and horn will be supplied with vessel. 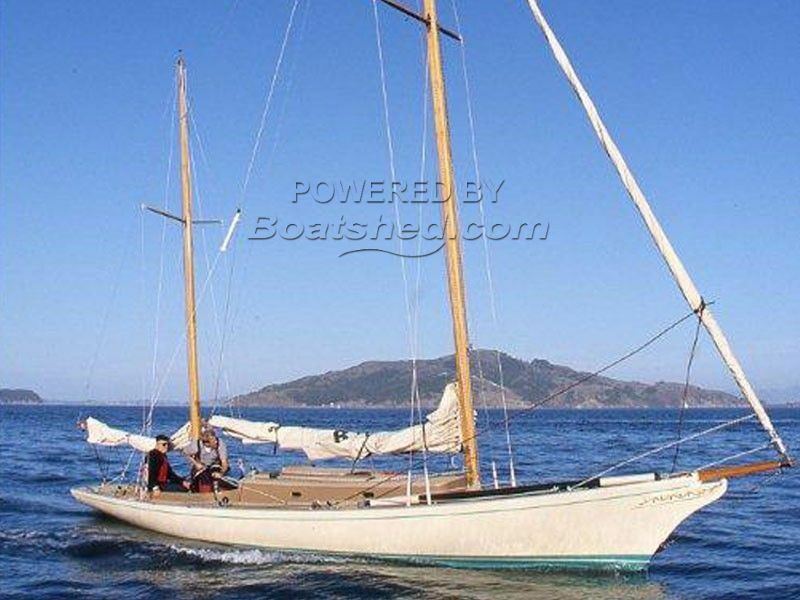 This classic jewel is a reproduction of L. Francis Herreshoff's 33 foot ARAMINTA. Built by Legendary Yachts in 2000 it was built to remain true to Herreshoff's design and was executed with a high level of craftsmanship. The vessel was shipped to San Francisco as a new boat for the San Francisco Boat Show. She remained there for two years to be shown and to sail the bay, and was then shipped back home where it was re-painted, re-varnished, decommissioned and stored in the building where it had been built. Today it appears as a completely new boat. The masts and rigging are wrapped in plastic and are stored in racks. All the interior components are in protective wrapping. The sails and running rigging are bagged, marked and stowed. Be prepared for the attention you'll received from anyone who appreciates classic yacht design and construction. This is a stunningly lovely boat. This Legendary Yachts Araminta 33 Ketch Daysailer has been personally photographed and viewed by Gary Buck of Boatshed Tacoma. Click here for contact details. Please note this comments section is public. Please do not post your personal details here. To enquire about purchasing this boat, please contact the broker directly at garybuck@boatshedtacoma.com. Please read our commenting guidelines before posting.